A few weeks ago I was reading some of my favorite blogs and ran across a Book Club on Crunchy Chicken's page. 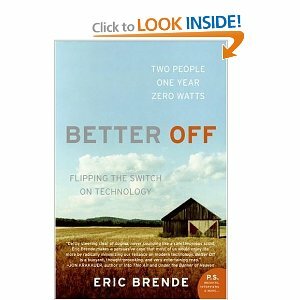 Her glowing description of the book Better Off by Eric Brende piqued my interest. So I reserved it at the library and have been devouring it over the last week. The book is about a fellow MIT graduate, Eric, who shucks his modern life in Boston for a very Old World Amish/Mennonite rural community that he calls the "Minimites". He and his new ex-accountant wife, Mary, descend on this close-knit community in their compact car with very little in the way of farming, homemaking or non-electric living skills to find that the community itself makes the modern "necessities" irrelevant. In the midst of their 18 month stay they find that Mary is expecting their first child and enlist the services of the community midwife who lives 6 miles away and has no telephone. I'm most of the way through this book and have enjoyed it immensely. Not only has the author explained how some of the basic farming and living tasks get done without electricity or motors, but he's described the "characters" in his story well enough that I know which ones I'd like to meet if I ever find this secret society. I have been interested in simplifying my life for quite a while, and will take some of the ideas from this book and the Minimite life to incorporate into my own life, but I have no desire to turn off my electricity and shun my gasoline powered car for a horse and buggy. You can read this book and follow along with Crunchy Chicken's book club if you want to discuss it...or you can read it and leave me a comment. I'd love to discuss the book with you, too!